24/7 on our GeoTrust Site. UnitedScrip is convinced that when it comes to fundraisers, 'One Size Fits All" just doesn't work! Scrip is no exception! 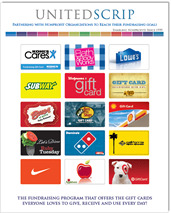 The Fundraising Flyer Program is an updated Scrip option with the look and feel of a traditional fundraising program. This new option incorporates a definite beginning and end date, offering items that everyone loves to give, receive, and actually use for their holiday gift giving and everyday purchases! Beautifully presented in full color, this 11" X 25.5" order form will also be a great way to introduce your scrip program to new families and supporters. We have designed the form with over 100 of our most popular vendors plus 32 regional retailers specific to your area. Reserve Your Fundraising Flyers Now!